Magnus Carlsen (22) is just three months away from the biggest chess match of his life, but "I do not feel any pressure at all. Everything is normal for me," he told Norwegian news agency NTB today. An interview/feature report appeared in the Norwegian website dagbladet.no. Carlsen said in the article, he was preparing himself physically for the long, tough days ahead in India and has a good team around him. "I am very conscious that we should not over focus on the World Cup match though," he said. His manager Espen Agdestein is quick to add that life is "usual" and "my job is to make every day for Magnus as it normally is before any major tournament." 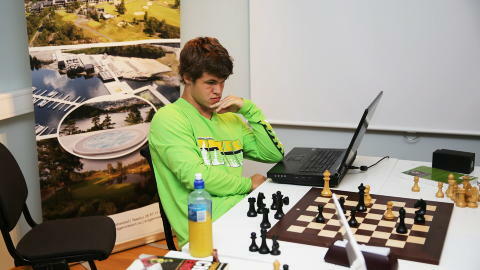 Carlsen is playing a lot of golf, tennis and beach volleyball as part of his fitness routine. Jon Ludvig Hammer is helping the World No. 1 with the chess bit. The World No. 1 has an India trip lined up followed by a short tournament in the US. "I'm most curious about how awful and hot it will be. We will also familiarise ourselves with the city, the sounds and the people there. We will also identify which hotel we will be staying," says Carlsen. Carlsen has also posted photos of himself on his Facebook page. Here is Carlsen's status post accompanying the following photograph. A lot of press appeared in Kragerø today. They filmed me making this golf putt!